Earn up to 79% profit. Discount cards are lightweight and easy to handle. Free shipping. Easy sales - everyone loves to save! No products to march door-to-door, all cards fit into your pocket! Select from 4 of the top discount card fundraisers in the industry. 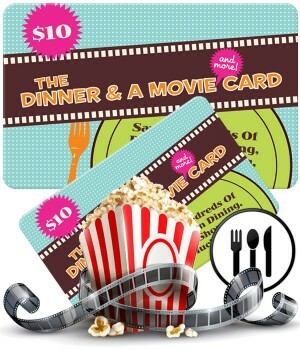 The Dinner & A Movie card is our most popular discount card fundraiser. Your supporters simply enter their unique code online and get access to discounts at their local restaurants and movie theaters. You make $6.50 profit per card sold. 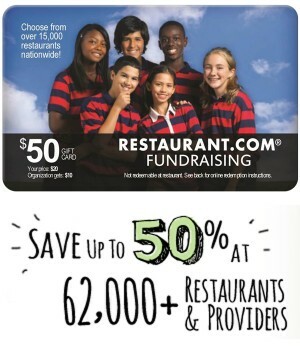 Raise your funds by selling a $50 Restaurant.com Gift Card, for only $20! Your supporters choose from over 15,000 popular restaurants online, print their discount offer, and redeem at restaurant. 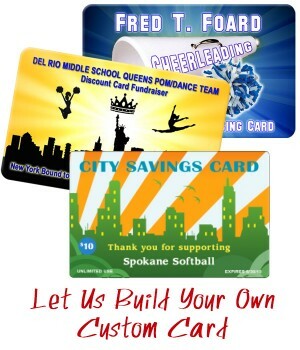 Let us build your own custom show-and-save Discount Card. We’ll contact local merchants and assemble a card with 10 valuable discounts. We will customize the cards with your group name and logo.